Every April and October, Seattle area diners look forward to Seattle Restaurant Week. The program actually extends over a two-week period (except Fridays and Saturdays) and features many restaurants that have agreed to offer a 3-course dinner for $30 per person (and, in a few cases, two-course lunch for $15). These prices can be great values when one considers that big-name restaurants participate and offer many of their popular menu items. So far, my wife and I have gone twice in the last week, for dinner at one of our favorite restaurants, Monsoon East, where we enjoyed some of our favorite dishes. For lunch on Thursday, we went to Tom Douglas’ Etta’s Seafood. In the Tom Douglas empire, Etta’s is one of his earliest ventures, doing business since 1995. Because of its focus on serving freshly caught seafood, quality and no doubt proximity to Pike Place Market, it remains a very popular restaurant among locals and tourists alike. The two-for-15 Restaurant Week deal gets you a choice of appetizer and main course (dinner adds dessert). In our case, we shared steamed mussels and clam chowder as starters and pan-fried salmon and fish & chips for our entrées. 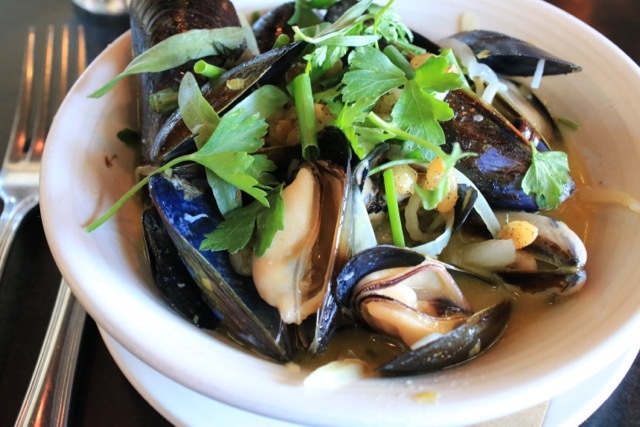 Not only were local mussels steamed perfectly but they were served in a superb broth, rich and slightly tart with beans that surprised with a crispy exterior (☆☆☆½). I wish that more restaurants would use panko for their fried fish batter like Etta’s. Personally, I find flour batter less appealing, the more thickly-applied examples having a tendency of soak up more oil. Etta’s was nicely crispy and while the cod was very fresh, it could have benefited from more seasoning (☆☆☆). The accompanying fries and cole slaw were quite good. Douglas makes a proprietary spice rub called Rub with Love, which is used primarily for salmon, and is available commercially. Etta’s preparation with wild-caught salmon (pictured at the top), which quickly became a signature dish long ago, is remarkable for its perfect balance of being smoky, sweet and herbal (☆☆☆☆). 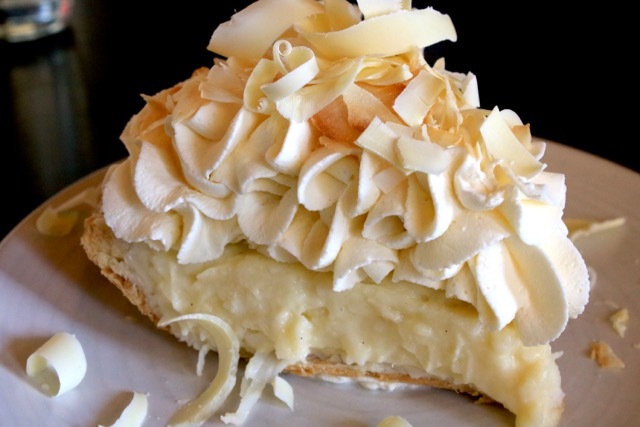 We finished our meal with Triple Coconut Cream Pie. The convenience of having a restaurant attached to a theater is very appealing. Before or after a performance, all you need do is walk a few steps. It’s also a bonus when the restaurant is well regarded. No additional driving, no fuss. Fins Bistro happens to be next door to Village Theatre in Issaquah. There is even a pass-through entrance between the theater lobby and restaurant when there is a performance. Moreover, if your hankering for theater refreshment during intermission goes beyond the lobby’s candies, cookies, bottled water and coffee, you can pre-order desserts and drinks from Fins. A nice symbiosis. As the name suggests, Fins is a seafood restaurant, with a smattering of meat and chicken entreés for the non-pescetarian. Three of us dined here immediately following an afternoon performance (“No Way to Treat a Lady,” a musical comedy that I highly recommend for its dark humor and high camp). One of tonight’s specials was bacon-wrapped scallops (☆☆☆), three enormous specimens that were pan-seared and served over creamy risotto. I personally prefer scallops to be a tad more cooked, those served tonight being almost raw, but it’s a minor quibble. The bacon strips were a nice, crisp counterpoint. I really shouldn’t have ordered a lamb shank. It’s like ordering a steak at a seafood restaurant (and there are a couple on Fins’ regular menu) or a burger at a Chinese restaurant. After all, there were many interesting-sounding seafood dishes. That being said, the shank was quite good (☆☆☆), fork-tender as I would’ve expected, pooled in a chianti sauce reduction with plentiful vegetables and accompanied by garlic mashers. It so happens that my lamb shank ideal is made right across the street at Max’s World Cafe, so in some ways my order tonight had an element of wanting to make comparisons. Kudos to the restaurant for squeezing our party in on a fully booked night only minutes before the performance and to our waiter who had a sense of humor and was efficient without being overly attentive. Fish and chips restaurants abound in the Pacific Northwest, not surprising when there’s nothing but the Pacific Ocean to the west. Perhaps the most well-known fish-n-chippery in the Seattle area is Ivar’s, once owned by Ivar Haglund whose image and personality in local circles rivaled those of Colonel Sanders. His corporation also used to fund a big fireworks show on July 4th in Elliott Bay, during its heyday one of two big shows (the other being on Lake Union). Less self-promotional and popular in the area is Spud Fish and Chips on Alki Point, though lately the quality of the Juanita franchise has definitely declined. There are many opinions on what constitutes the best fish and chips. Some prefer thick batters, while others prefer a light coating. Should the batter be flour, cornmeal, cornstarch or a combination? Then, there’s the choice of fish. It goes without saying that the fish has to be fresh and it has to be adequately seasoned without being salty. My daughter and son-in-law swear by the version served by Nordstrom Grill (of department store fame) in Seattle, which I have yet to try. Otherwise, my wife and my favorite place is not in Seattle at all but in Christchurch, New Zealand (Coppell Place Seafood). Last weekend, good friends of ours invited us to accompany them on their boat to the Quartermaster Yacht Club’s annual potluck, this year at the Des Moines Marina. A few of the club members mentioned Wally’s Chowder House, only a half-mile walk uptown, as an excellent place to get fish and chips. Waiting to get seated was common. When we went for lunch last Saturday, a hand-printed note at the entrance announced that Wally’s was again nominated in the Best Seafood category in the 2014 King 5 Best of Western Washington. Furthermore, a placard proudly proclaims that the fishing boat Golden Alaska catches and flash-freezes 50,000 pounds of arctic cod for Wally’s every year, which works out to be about 135 pounds daily. With this much brouhaha, why have I not heard of this place before? On the specials board was fried razor clams, which gave us pause. But we were here to sample the fish and chowder, the two menu items that put Wally’s in the hearts and minds of followers. The New England clam chowder (☆☆☆) could not have had better flavor but it was excessively thick. So much flour could almost have held up a spoon without moving. On the recommendation of a couple of diners who were in our party, my wife and I split a one-piece large fillet with fries. When it arrived, I saw it was good advice. You can also order 2-, 3- or 6-piece quantities. There was likewise a good-sized portion of fries. It made no difference that they were in fact bottomless, because they were mealy (☆☆). Neither were we impressed with the fish (☆☆). It was dry and rubbery. I’ve never been fond of fish that had been previously frozen because it cooks, well, dry and rubbery. In addition, there was no discernible seasoning; the fish tasted flat. It might’ve been wiser to get the fresh local ling cod or halibut. We wondered what the fuss was all about regarding Wally’s. We won’t be returning. I’m not referring to their quality necessarily but their size. Ivar’s Seafood Bar at Gene Coulon Memorial Beach Park is offering Super Clams, apparently for a limited time or perhaps as a promotion for Ivar’s 75th anniversary. Bigger than its regular fried clams, these are king-sized strips, some pieces almost 3 inches long, none of them smaller than two. 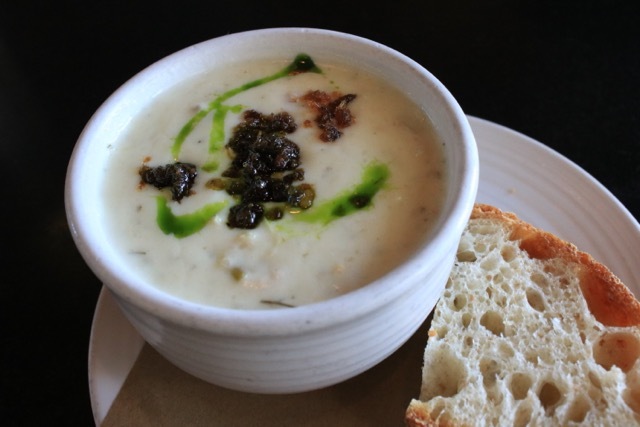 A local institution in the Seattle area, the Ivar chain of restaurants is known primarily for fish and chips and, arguably more famously for its New England-style clam chowder. Its motto is ‘Keep Clam.’ Even if I do like their fish, I find myself ordering the clams more often. Regular-sized ones do have a problem. It is that the smaller pieces are mostly batter. While appealingly crunchy, they lack much clam flavor for obvious reasons. So, when my wife and I stopped here after a walk along the park’s beautifully maintained trail along Lake Washington, we had to ask what the Super Clam special was. The cheerful employee explained that the clams consisted of much bigger pieces. Okay, then, good enough for us. I also noticed that two other specials were fried green beans and smoked salmon chowder. True to their potential, the clams were meaty and full of clam flavor, if a tad rubbery (☆☆☆½). Clam strips seem notoriously susceptible to vulcanization, except that those I had many years ago at Howard Johnson’s in Culver City, California (now closed), were surprisingly light. Ivar’s batter, likely a combination of cornmeal and flour, was crispy and nicely seasoned. These clams were the equal of those we had at the Minute Cafe in Bandon, Oregon, for size and taste. The fries were crispy and fluffy but under-seasoned (☆☆☆), while the green beans lacked much flavor (☆☆), suggesting they might be frozen beans. A combination of cream and tomatoes gave the smoked salmon chowder an appealing broth. There weren’t very large pieces of fish in an otherwise tasty, salty soup (☆☆½). Coulon Beach is a nice location for Ivar’s. At certain times of the year, it might be the most popular in the chain, as lines of hungry customers can snake out the door. During the summer, the park is heavily used. You can eat inside the restaurant, which has a canoe and kayak suspended from the ceiling, or at one of many tables in the large, public covered pavilion next door. If the weather is nice, you have the entire park at your disposal, including picnic tables and bench seats. I’m hoping that the super clams become a regular part of the menu and available at other Ivar outlets, if it hasn’t already. Among the benefits of having a dog is taking it on its daily walk. I might grumble about having to do this every day, but once I’m out on the sidewalk or on the dog-friendly trail, it isn’t so bad. On rain-free, crisp mornings, the walks can be exhilarating. The exercise, so I tell myself, profits me more than sitting on my fanny, which I’m inclined to do at home, all the more in my retirement. Luckily, I realize that I’m only dog-sitting for my daughter and that she will be home in a few days to reclaim her doggie. Another benefit of walking the dog are noticing things you wouldn’t otherwise. One of these things, it so happens, was spotting a food truck that was pulling into the parking lot of Datasphere Technologies, across the street from Spiritridge Park in Bellevue, where my wife and I commence our dog walk. Today, Fish Basket was selling its fish tacos, fried seafood and chowder. Fried seafood includes cod, salmon, halibut, shrimp, clams and calamari, each with a side of either chips or slaw. The cod ($8) is the best fish value as the salmon and halibut set you back $1 and $3.75 more, respectively, for two pieces of fish (and side). The batter is thinly applied (my preference) on fish that needed more seasoning and freedom from the freezer that dried out its flesh (☆☆½). On the other hand, the fries were deliciously seasoned with paprika and other spices and coated with perhaps a thin layer of cornstarch batter that gave them a nice crispiness. The tartar sauce deserves special mention. It’s homemade, tarter than most with more dill pickles. Foil packages of malt vinegar and hot sauce are available in containers at the cashier. Whenever we have the opportunity, we get fried clams. Today was no exception. Generously-sized clam strips were coated in super-crispy cornmeal batter (☆☆☆½). The clam flavor was robust and cried out to be tasted again in the near future. Most of the positive reviews center on Fish Basket’s tacos, which are listed first on the menu. They will be next on our “try” list along with clam chowder. But, we’d be hard pressed to pass up the clams. With the concentration of high-tech companies in the Eastgate area with generously-sized parking lots, it was inevitable that food trucks would be contracted to service their employees. I’m just beginning to identify where these spots are, but there are at least three of them. Over time, I imagine the popularity and frequency will steadily grow to the point where employees working at these high tech companies will be awash in food trucks, or is that just a pipe dream of mine? Fish Basket is a good start. 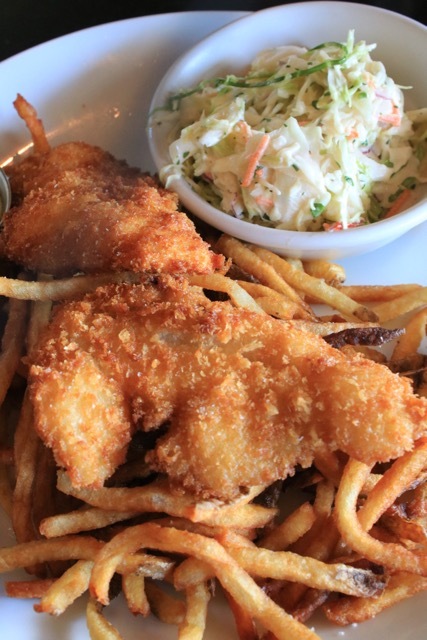 Along the Oregon coast, seafood restaurants are as numerous as the sea stacks offshore. Mo’s is a local seafood restaurant that established a reputation with its clam chowder. There are now six locations, including two in Newport, where Mo’s had its beginning. Since my wife and I were driving through Florence, we stopped here for lunch. Our real intention was to have lunch in Bandon where we were surprised with very good fried clams at the Minute Café in 2009. But the hour was getting late and we were still about an hour away from Bandon. At Mo’s, we were greeted at the door with bouncy enthusiasm, everyone wishing us a wonderful meal. Even if it was a very popular restaurant, we were seated right away. Our shared plates included a green salad topped with bay shrimp and fried clam strips. We each got our own cup of chowder. The chowder (☆☆) was very thick from cornstarch and dissolved potatoes, of which there was an excessive amount, cut into various size cubes. There also weren’t very many clam pieces and the broth was weak in clam flavor. Overall, a disappointing version considering its reputation. While the clam strips (☆☆½) were fine, they did little to make us forget Bandon. As we left Mo’s to take a stroll through Old Town, employees outside ICM Seafood Restaurant were handing out small samples of their clam chowder (☆☆☆½). Now, this was an excellent rendition, full of clam flavor, suffering only from sandy grittiness. Not only that, fried razor clam strips were on the menu. We had eaten lunch at the wrong place. Next time! The best cioppino we had ever eaten was had at Sharks Seafood Bar back in 2009. Not only was there a substantial broth of tomatoes, vegetables and herbs—a recipe which the chef will not divulge—but a generous serving of fresh seafood. A noticeable amount of sweetness, which some may find a trifle much, came through from a generous amount of tomato paste. Cravings for it were mitigated by the cioppino base being available by mail order; all you need to do is add your own seafood. But the experience of this wonderful stew cannot be matched by enjoying it made to order in the quaint, nautically themed restaurant, and surrounded by the historic Bay Street waterfront. Tonight, we decided to have a variation served with pasta. It isn’t technically a noodle dish but more aptly a stew with linguine in it. Marinara linguini (☆☆☆) comes with fresh Dungeness crab, two kinds of shrimp, and fresh fish (today it was rockfish). You could easily confuse this dish with another menu item, Cioppino and Pasta (☆☆☆), which only adds a few Manila clams for an additional $5. You might consider the marinara to be a better value. Both entrées arrived in large soup bowls filled to the brim and held their piping hot temperature long after they were placed in front of us. In the end, both of us agreed that the straightforward stew was preferable for no other reason than to forgo the starch that tended to sate us sooner than without and that the residual liquid from the pasta had a diluting effect. Otherwise, the cioppino appealed to our taste buds as much as the first time.